Wayne Densch Charities presents the check to LIFT representatives at the LIFT Orlando HUB. In the background is the $40 million mixed-income housing development, Pendana at West Lakes. “This generous and important gift from Wayne Densch Charities represents the first major investment into our health and wellness plans for West Lakes,” said Eddy Moratin, Executive Director, LIFT Orlando. “We are so excited to build momentum towards the goal of improving health, quality of life and overall life expectancy,” continued Moratin. 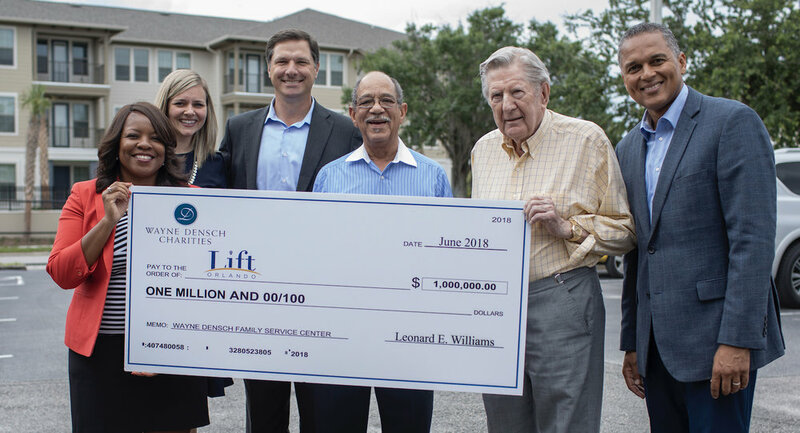 “Through our first major philanthropic investment in the 32805 zip code, we are so proud to partner with LIFT Orlando and the residents of the Communities of West Lakes in a way that will leave a lasting legacy for the benefit of generations to come,” said Leonard E. Williams Sr., President, Wayne Densch Charities. Identifying a strategic focus on health and wellness began in 2013 when LIFT Orlando hired the Polis Institute to conduct the largest neighborhood survey in Orlando encompassing 1,500 households in the 32805 zip code. One of the biggest concerns identified in the survey was community health and wellness. An ongoing dialogue began with LIFT Orlando listening to residents and identifying programs, services and facilities to support and improve health and wellness outcomes in the Communities of West Lakes. Over the past year community interest in health and wellness has grown. In response, LIFT Orlando sponsored an in-depth, door-to-door survey that reached nearly 270 households and identified specific concerns and desires around health and wellness. The results affirmed the need for increased access to high-quality healthcare, support services and community facilities, primarily for the residents of West Lakes. This investment follows construction completion of Pendana at West Lakes, a brand new $40 million, 200-unit, mixed-income apartment home community. Plans are also underway to develop 120 affordable, senior apartment homes, a community health and wellness center, and a new, state-of-the-art Boys and Girls Club in the West Lakes area. Wayne Densch Charities, Inc. is a unique charitable organization that works one on one with people who are seeking assistance. Established in 1994, the foundation provides direct assistance to relieve stress to poor, elderly and homeless individuals. The Charities also assists youth and senior organizations who serve the less fortunate, helping them to live better lives. LIFT Orlando is a nonprofit organization consisting of business leaders partnering with residents to drive investments that strengthen the Communities of West Lakes through mixed-income housing, cradle-to-career education, community health and wellness, and long-term economic viability. LIFT was founded in 2012 in partnership with Florida Citrus Sports for the benefit of the residents living in the shadows of Camping World Stadium and serves the key role of a “community quarterback” to unlock the power of collective impact by coordinating the geographically focused efforts of multiple organizations around a single neighborhood.